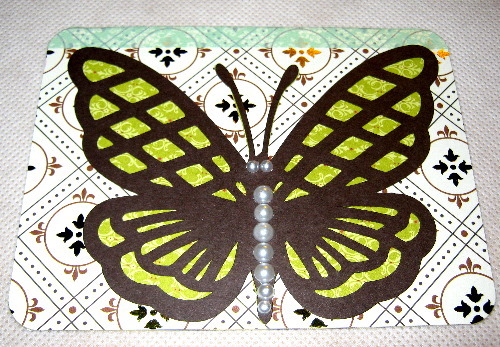 Posted on September 27, 2010 by Albert G.
Here’s a card project that uses Cricut cuts from the “Martha Stewart Crafts Elegant Cake Art” cartridge from ProvoCraft. The foiled cardstock (double-sided) base of the card is from SEI’s “Windsor Collection”. It was cut at 5 1/2″ x 8 1/2″ and scored at 4 1/4″. 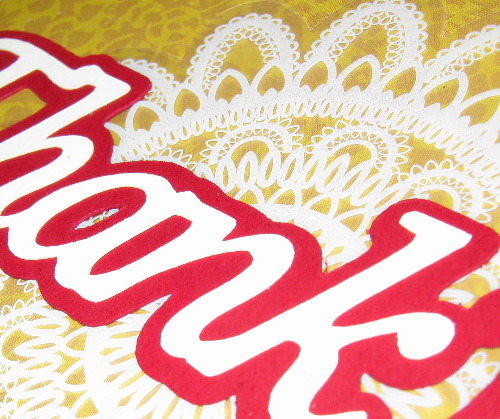 I used my 1/2″ Zutter Round-It-All to cut the corners off the card. 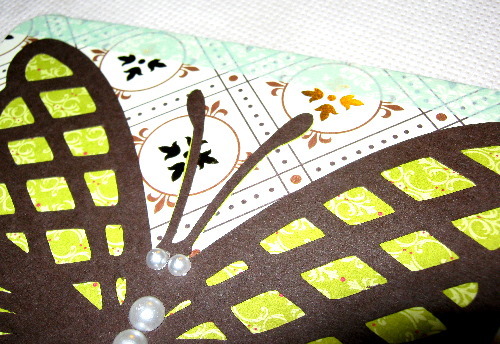 The lattice work butterfly was cut at 4 1/4″ on my Cricut Expression. 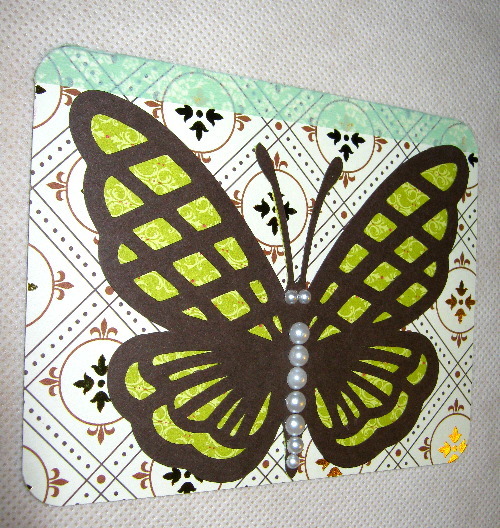 The base layer was a piece of decorative paper from Stampin’ Up!’s retired designer series paper “Raspberry Lemonade”. 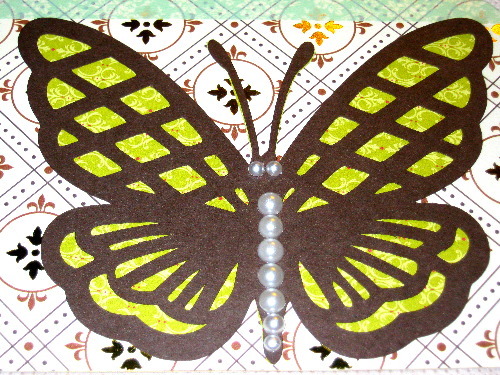 The top layer is cut from a 6″ x 6″ inch piece of Stampin’ Up! cardstock in Early Espresso and adhered to the base cut with Zig Two-Way glue pen. 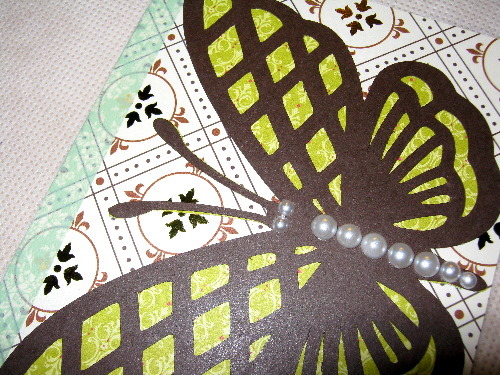 A piece of green washi (rice paper) tape was used as an accent across the top of the card, as well as some Kaiser Craft pearls on the body of the butterfly. I thought it would be interesting to put my sentiment cut on the inside of the card (not too mention there was no room on the card face). 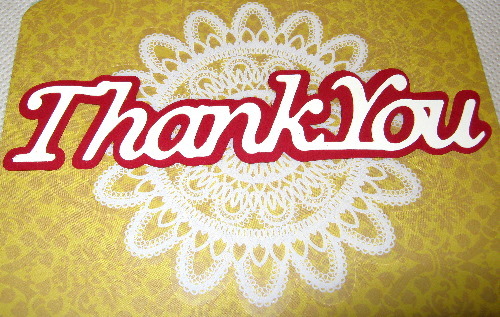 The sentiment is from same Martha Stewart Cake cartridge and was cut at 1″. 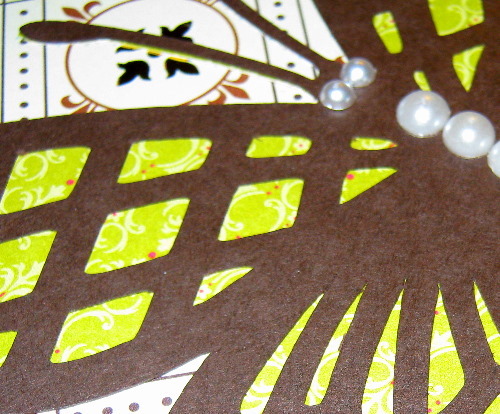 The shadow layer is cut from Stampin’ Up! Cherry Cobbler cardstock, while the top layer is Very Vanilla. Again, I used my Zig pen to put the layers together. 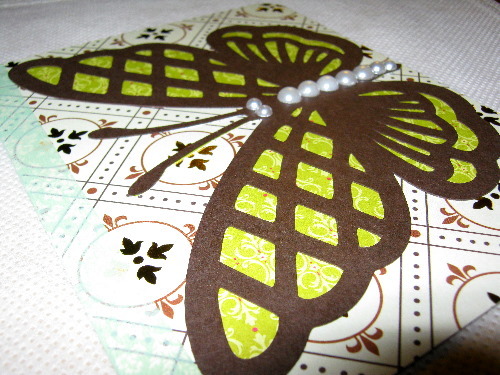 Before laying down the sentiment, I used a Maya Road acetate doily in White for visual interest. 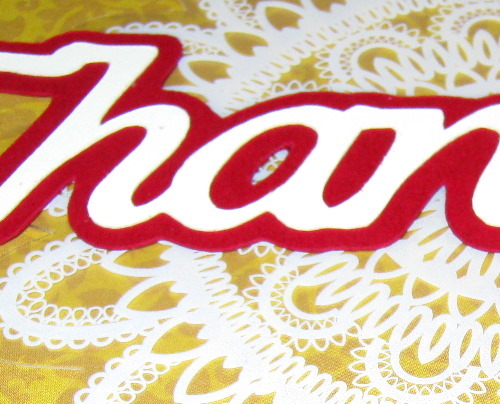 I used a glue dot in the center to adhere the doily (which in turn was covered by my sentiment cut. Overall, I like the bright cheery results. Oh, and don’t forget: Any of the cartridges designed for the Cricut Cake machine will indeed work in your regular Cricuts. So don’t pass-up the great Martha Stewart approved artwork on her cartridges or any of the other Cake cartridges. You’ll be sorry you did!